For the past five years after my departure from MA in Poverty, I have been luckily interacting with IDS. In this post, I will look back into my work experience and share how it affects my work. “I am Ippei Tsuruga, working for Japan International Cooperation Agency, and I am also an IDS graduate.” That is how I introduce myself when I meet new people, and it works much better than just giving a boring business card. As a staff member of a bilateral development agency, I often meet senior government officials and practitioners in developing countries. You could imagine how challenging but important the first meeting is to build up good relationships with those experienced people. Talking about IDS is always a good start for a friendly conversation. In my experience, people in the development community somehow link to IDS. Even though they are not IDS alumni, they likely have friends or colleagues from IDS or work together with IDS. All of them have a good impression about IDS and its alumni. Whenever I need information about poverty related issue, I rely on the source of IDS. In 2011, I was in Kenya to conduct a stock taking survey for formulating an assistance portfolio in response to the worst drought in 60 years. Our agency had not been involved in any interventions in arid areas. So we had no experience and no networks. I had only one week to map who was working for what projects, to find out needs, and gaps for further investment. Where should I start? That was my first reaction when I got this task. What I did was to go to the IDS website and Eldis catalogue to learn about existing social protection mechanisms and key players for the issue in the country. I then found that the Hunger Safety Net Programme, a cash transfer scheme, was a flagship social protection scheme, and IDS’ Centre for Social Protection was involved. Having a contact, I visited the ministry in charge of the programme on the first day. It was completely successful. Beginning with the introduction mentioned above, we started very friendly discussion and I got a lot of information about the project, the overall framework of social protection in the country, and focal points at other agencies. Our mission ended up with a comprehensive assistance package at the end. As Lawrence Haddad summarised in his blog Development Horizons, we are working on a joint research project on Quality of Growth. I join to coordinate this project and contribute one paper. I particularly like this project because of its critical perspectives. When talking about growth, one of the biggest questions is what we expect from growth. Why do we want growth? It may be for money, savings, or wealth. Development practitioners might say for helping the poor out of poverty. Then another question comes. Growth for whom? Policy makers and development partners still tend to quickly translate ‘growth is good for the poor’, trickle-down theory. Even though they further think of the question in depth, they might be stuck at pro-poor growth discussions. Is it enough to cover the issues that we are facing today? My passion is to work for poverty alleviation throughout my career. That is something I learned from IDS. When I left IDS in 2009, one of my dreams was to work with IDS. It has come true. IDS has given me a lot even after my graduation. I believe that my responsibility is to devote my career to poverty reduction. 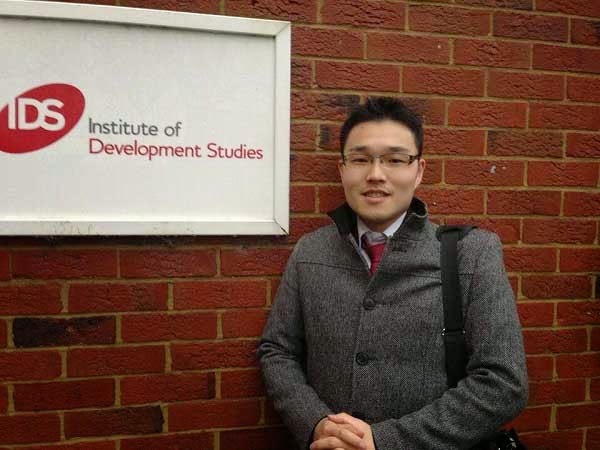 This blog is by IDS alumni Ippei Tsuruga and has also been posted in The Povertist. This IDS Alumni blog is no longer used but has transferred to the IDS website. IDS alumni are located all over the world and after studying at IDS go on to a range of careers in development. This makes the Alumni Blog uniquely placed to represent opinions on development from a diverse range of experience and professions, all of whom have IDS in common. Traction Politics is taking birth in India!